SUBHEAD: Bayer and Syngenta criticized for secrecy after unpublished research linked high doses of their products to damage to bee colonies. 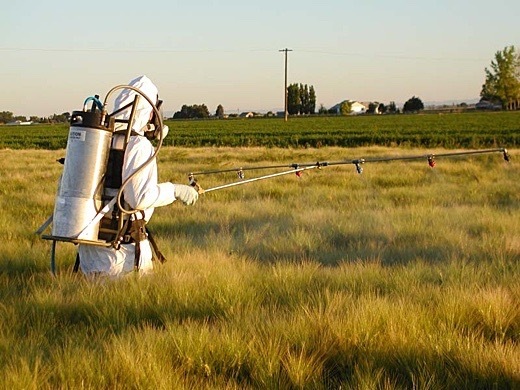 Image above: Man spraying barley with Syngenta's thiamethoxam. From (http://wrir4.ucdavis.edu/PHOTOS/CONDUCT/pages/Barley%20thiamethoxam%20ID.htm). Scientists also noted that the companies have been previously been critical of the research methods they themselves used in the new studies, in which bees live in fields but are fed sucrose dosed with neonicotinoids. In 2014, commenting on another independent study, Bayer told the Guardian the bees “are essentially force-fed relatively high levels of the pesticide in sugar solutions, rather than allowing them to forage on plants treated with” pesticide. Utz Klages, a spokesman for Bayer, said: “The study [Bayer] conducted is an artificial feeding study that intentionally exaggerates the exposure potential because it is designed to calculate a ‘no-effect’ concentration for clothianidin. He said a public presentation would be made at the International Congress of Entomology next week in which the new results would be discussed. Researchers also note that pollinators in real environments are continually exposed to cocktails of many pesticides, rather than single chemicals for relatively short periods as in regulatory tests.